Don’t get towed. Minneapolis and Saint Paul snow emergency alerts exclusively for iOS. 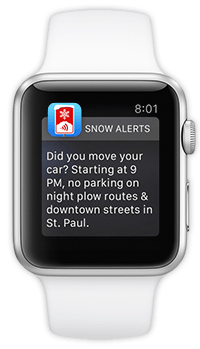 Get push notifications right when when Minneapolis or Saint Paul declares a snow emergency, and get reminders each time you have to move your car. 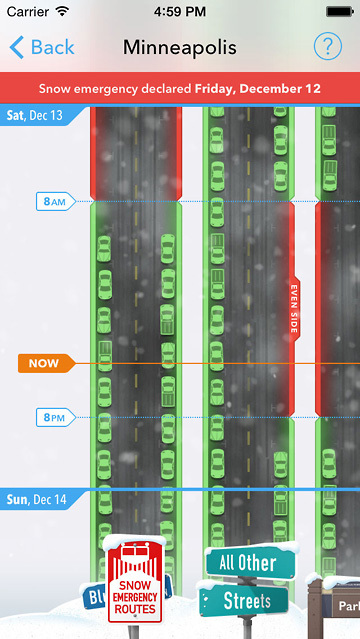 A visual diagram shows you where to park (and where not to park) during a snow emergency. Check the app anytime to see when you have to move your car. Tap anywhere on the street diagram to read the parking rules as defined by the City of Minneapolis or the City of Saint Paul. Follow these rules and don't get towed! Snow Alerts was crafted for the good people of the Twin Cities by Swing Set Labs, a small product incubation company. © 2019 Swing Set Labs. All rights reserved.